what matters most: the cherry on the top! i have sung with the temple hill choir on and off for ten years now. not gonna lie - it's a big committment. rehearsing from 6-8 pm every sunday evening up in oakland. but last night reminded me, once again, of why i love it and why no christmas would be complete without it. we had a joint concert with the sfsu handbell choir. it originally was supposed to be held at the interfaith center at the presido in sf, but about a month and a half ago we learned that we had lost that venue for this year. when i heard we needed another place to perform i immediately thought how awesome it would be to bring this christmas concert to fremont. it worked out that our stake - who always plans fabulous christmas music firesides - had chosen not to plan one this year. so they were open and welcomed us. yahoo! yippee! when i shared the flyer/poster they had prepared with both choirs they were impressed with how professional it made us look (lol), to which our director, alan chipman, replied - "this is what you get when you do something in fremont. fremont knows how to do things right!" this years musical selections for our concerts were so beautiful. i often found myself hearing them ringing in my mind at random moments. they just stuck with me, and i loved it. the only sad thing was, not having very large audiences to sing them for. attendance at the oakland concerts was disappointing, to be honest. i just wanted everyone to hear this music. every year singing it makes my christmas complete. for me, personally, it is the most worship-filled part of my christmas season. 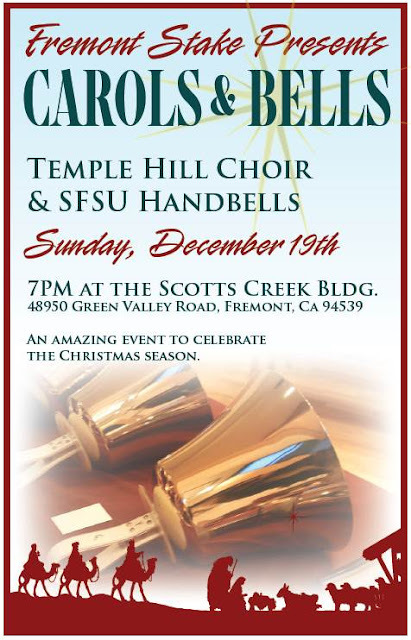 i often hear of the great experience the choir has singing with the sfsu handbell choir - but this year was my first time being treated to the experience. 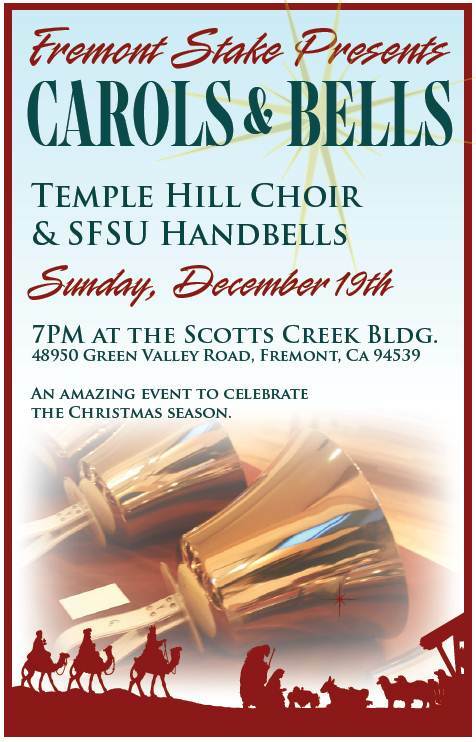 is there anything lovelier than the sound of handbells playing at christmas? or anything more intriguing than watching them being played? well, last night's christmas concert left me floating! i think the entire choir was a bit doubtful when they saw seating for 600 people set up. maybe three hundred would be there...which would be a delightful audience to sing for. but by the first downbeat - seats were filled to the back of the second cultural hall! by far, the largest audience we have ever sung for! you know, this probably shouldn't be the case, but it's true nonetheless. we sing better for a bigger audience. and last night we sang our hearts out. those melodies and messages just floated and filled the entire building! and i thought..."now THIS is how these pieces were meant to be sung!" (baby in a manger, the shepherd's carol, have yourself a merry little christmas, what shall we give, oh holy night, way down in bethlehem, gentle mary, bells of joy, silent night) it's a good thing that i have a good portion of the music memorized, because i couldn't see my music through my tears on multiple occasions. joyful, spirit-filled, on-a-high tears! and what a treat to sing 'this is the Christ' - and as we always do, inviting former members of the choir up to join us, and to have 10 people join us from the audience who have shared this choir experience with us at some time in the past. this choir has such a family feeling to it, that it was like having family members come home. the handbell choir followed us, and i felt like a little child taking in their every move and every note as they played. i just didn't want it to end! they were simply magical! we had the treat of finishing the evening singing our third and final piece jointly with them - joy to the world! when we had sung the final notes - i knew nothing could make me feel more of the christmas spirit than i was feeling at that very moment. my christmas was once again, complete. but this time on an even richer - and more memorable level than ever before! it was truly the cherry on the top of my christmas!